The unmistakable Asian flavor combination of Sesame and Ginger team up perfectly in this BBQ pork tenderloin grilling recipe. The longer you let the meat soak in the pork tenderloin marinade recipe the better, it really turbo-charges the taste of this lean cut of meat. 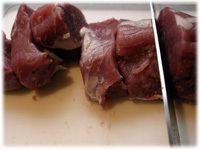 These particular pork tenderloin cooking instructions call for you to slice the loin into 1" thick medallions. 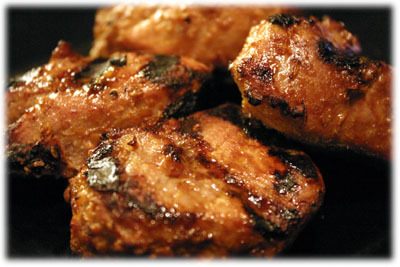 This ensures the marinade flavors penetrate the meat deeper and also makes for a very quick grilling session. I also like to serve these grilled tenderloin medallions with this grilled asparagus recipe, matches well with the sesame flavors. 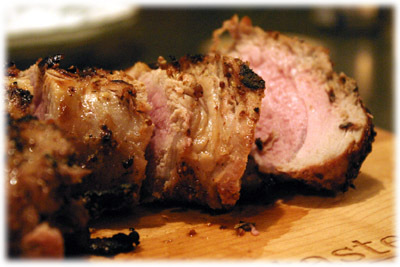 Lay the pork tenderloins on a cutting surface and slice them into 1" medallions. 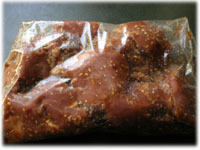 Place the sliced pork tenderloin medallions in a resealable plastic bag. Add the pork marinade ingredients to the plastic bag, seal the bag and manipulate the medallions in the marinade so they're completely covered. 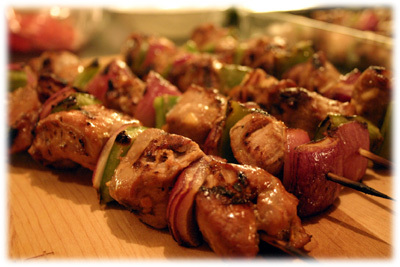 Place the bag in the refrigerator, preferably overnight to allow the flavors to penetrate the meat. 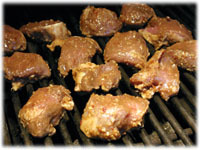 Remove marinated tenderloin medallions from the refrigerator and let it come to room temperature (still sealed in the bag). Preheat the grill to 550F and clean/oil the grates well. 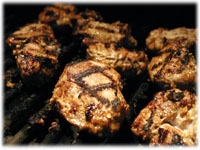 Oil the grates by dipping a folded paper towel in vegetable oil and using your BBQ tongs swipe it across the grates several times. 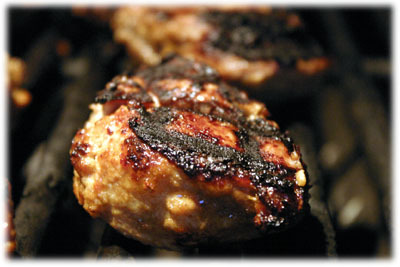 When the grill reaches cooking temperature put the pork medallions on the grill and close the lid. After 2 - 3 minutes lift the lid and rotate each medallion a 1/4 turn to produce a cross-hatch grill pattern. After another couple minutes lift the lid and flip the tenderloin medallions over and close the lid. After another 4 - 5 minutes lift the lid and use an instant read thermometer to check the internal temperature of the largest medallion. When it reads 145F then remove them all from the grill to a serving platter and cover with aluminum foil for 5 minutes before serving. Please don't overcook these or they'll dry out. 145F is the ideal internal temperature for cooking bbq pork tenderloin to medium and keeping it juicy and moist at the same time.